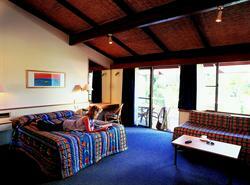 Nautilus Beachfront Villas is located 7 kilometres north of the Big Banana, along the Pacific Highway. Look for the large Nautilus Roadsign, and take the right turning lane off the highway. A resort experience for the price of a hotel room!!! A beachfront resort on 9 acres of tropically landscaped gardens. Nautilus Beachfront Villas & Spa is set on nine tropically landscaped acres of absolute beachfront, five minutes north of Coffs Harbour. Whether you are looking for serene relaxation, a spot of adventure or a touch of indulgence this is the place for your perfect break. The Resort has been designed to blend into it's privately owned spectacular beachfront, creating privacy and comfort and a peaceful atmosphere in the process. Nautilus Beachfront Villas & Spas' fully equipped villas are 'non-serviced' luxury accommodation, serviced for your arrival including a complement of towels and linen. Additional services are available at a nominal cost. For those who want a 'do it yourself' holiday, choose a villa with a fully equipped kitchen including microwave and dishwasher, and laundry with washing machine and dryer. Or choose a standard villa and the Nautilus team will be happy to do it all for you. The resort has a range of facilities from the S-Cape Café Bar Restaurant, Tree of Life Wellness Centre and Day Spa, three swimming pools, indoor and outdoor spas, a gym with ocean views, two full size day/night tennis courts, a basketball court, a kids playground and 5 BBQ areas. There is plenty to keep you occupied. Sometimes it's the little things that make a big difference. Private north facing patios for maximum winter sunshine and in-room reverse cycle airconditioning to keep you comfortable year round. High vaulted ceilings emphasise the spaciousness of the rooms. A Resort Shop with all the necessities. A dedicated car wash area and a parking spot close to your room to make unpacking the car that much easier! 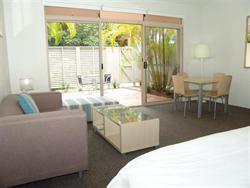 Includes accommodation only in 2 Bedroom Poolside Villa. 96 Square metres; Reverse cycle air con; Queen bed, 3 singles and a single sofa bed; 2 bathrooms; kitchen; laundry; separate lounge room. Private Enclosed Courtyard. Rates based on 4 guests- sleeps max.6, extra guests $10 per person per night. Cots on request extra $10.00 fee per night. Approx 39sq metres inside plus new 20sq metre fenced courtyard with your own private BBQ & outdoor table setting; 1 King Bed, Reverse Cycle Air Conditioning; kitchenette with hotplates, microwave & fridge; washing machine & dryer; lounge, ottoman, coffee table, dining setting & flat screen TV with complimentary movies. Rates based on 2 guests. Room will sleep a maximum 2 guests only. Outside of Holiday Season : one nights accomodation (deposit) within 14 days of the arrival date. School & Public Holidays : $500 (deposit) within 30 days of the arrival date.